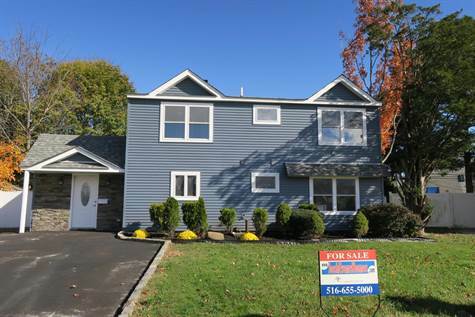 SALE PENDING $545,000 Total Renovated Colonial 2285 Sq. Ft.
"5 Bd. 2 Bath Renovated Colonial"
Total Renovated 2285 Sq. Ft. Colonial. All New Roof, Siding, Windows, Heat, Kitchen, Bathrooms, Porcelain And H/W Floors, Electric And Plumbing. Kitchen W/Quartz Counter Countertops, S/S Appliances, Farm Sink, Stacked Stone Fireplace, Extra Large Fenced In Backyard, Storage Room/Workshop, Island Tree Schools, Taxes Do Not Reflect Star Savings Of $1689.